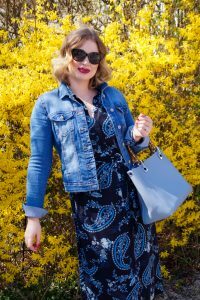 I wanted to share this adorable navy blue flower dress for a few weeks now and I finally got around to re-wear it and shot it. I personally love a navy shade over a black. It just flatters my skin tone much more. Anyways the dress is a H&M sale find and perfect for spring weather. It has buttons in the front all the way down and a belt made of the same fabric to set the focus on the waist. 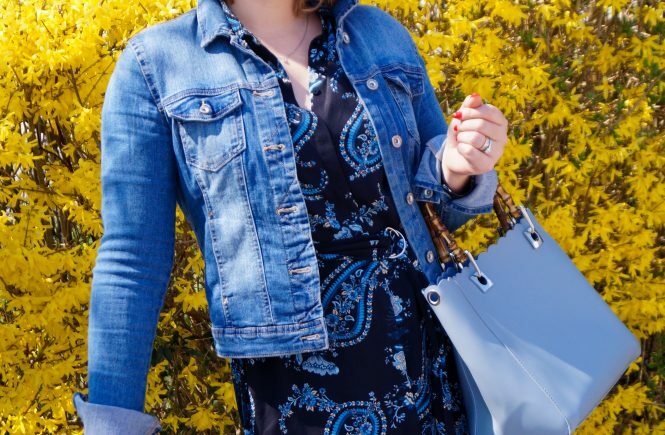 I paired the dress with a denim jacket since it has been chillier than it looks in the picutres but it would also be a good addition for a colder day in general or the cool spring mornings. And my favorite pair of espandrilles. I hope you aren´t already tired of them because I got them in black too and they are also already a favorite. But let´s skip to the handbag. Do you like the bamboo handle trend ? I personally do a lot cause in my opinion it adds such a fresh and summery touch to the look. I have a few different shapes, color and sizes of bags all with a bamboo handle and I wouldn´t want to miss them. The weekend has been pretty nice (weatherwise) and we also had our early Easter brunch with the family yesterday which was a huge success. The food tasted great and everyone ate and chated a lot. After everyone left we spent the rest of the day cleaning up and lying on the sofa. Not too bad for a lazy Sunday. There isn´t too much planned this week since I am at work from today to Thursday (although it is just a half day today – thank god). 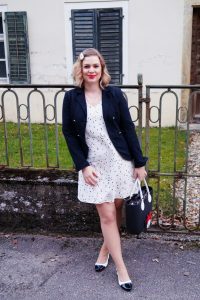 White polka dot mini dress…. for the majority there is only one more day to go and then it is weekend and for me it´s Friday today already and I couldn´t be happier. I do have a important appointment tomorrow and also a facial but more on that later. 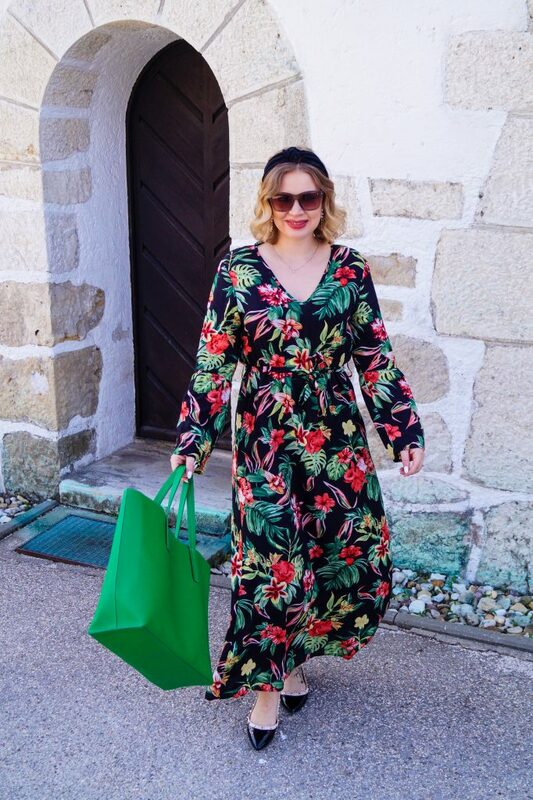 I wanted to share this adorable look on Madame Schischi I have worn on the weekend out for dinner with my in-laws and my handsome husband (maybe you have already spotted it on Instagram). I got this off-white polka dot dress last year and also shot the look but never came around sharing it cause I forgot and then I deleted the pictures. But today is the day. I went with an all black and white look from head to toe. I personally love a great black and white piece as it always works whether with like-minded pieces or bright colors. I just added a black blazer jacket to give the look some dimension as the white alone looked kind of awkward (I did think first it looked like a nightshirt???). 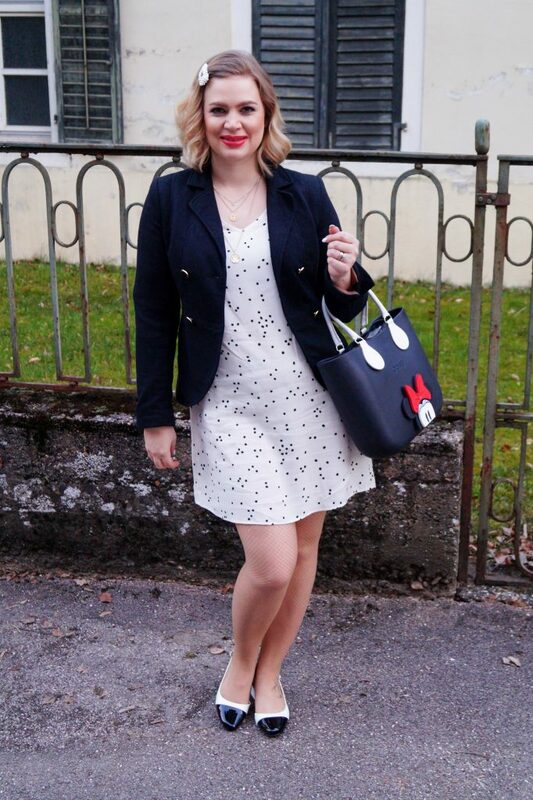 One of my favorite handbags was taken out for a nightly spin – the Disney collection O Bag I got in Milan. I still love it and like combining it to all sorts of black and white or all red looks. Another favorite of mine but in the shoe category are these sling back pumps I got from Asos. I have been dying to get my hands on a Chanel dupe from Sam Edelman of these sling back pumps but I don´t know how they will fit me and shipping to Germany is just so expensive. Glad I found my pair for ounder 50 Euro and I already have gotten a ton of use out of them. The patent style is really cool and they are super comfortable. We are staying in the accessory department as we are talking hair. I got this big pearl hair clip from amazon (they have a bunch of different styles) and already used it a lot. Totally love the girlie vibes it adds to a hairstyle or to the whole outfit. I have been loving a good graphic tee lately more than any other and I got quite the collection over winter time. 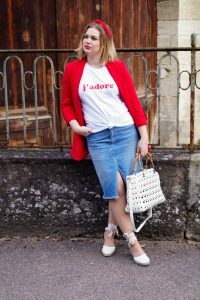 So I wanted to share some of my favorites differently styled over here on the blog starting with this white shirt including the oh so famous “J´adore” print. I enjoy wearing a graphic shirt with a blazer, it has become somewhat of a uniform for me over the last months. 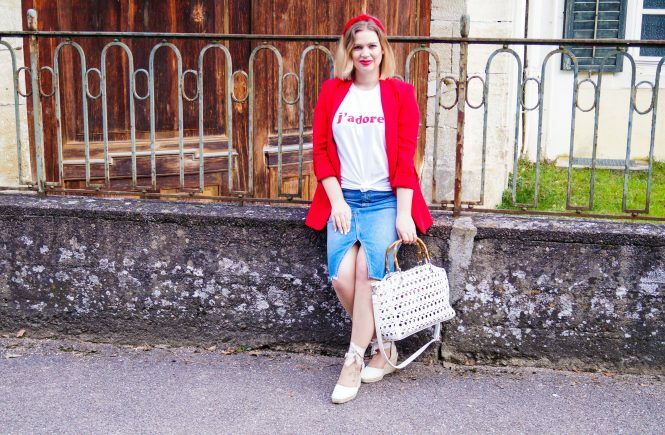 For today´s outfit I styled the graphic shirt with a red blazer jacket and a nice washed denim skirt. Since the t-shirt is a little long and has an oversized fit I decided to not it in the front. Knotting or tucking your shirt in creates a different effect for different styles you want to pull off. I decided to knot it this time cause it had the right length and it gave me all the cool vibes with the blazer. Setting contrasts is big in fashion so playing with it never hurts. 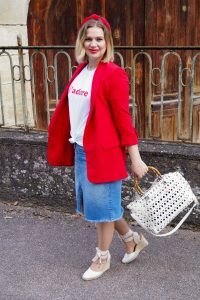 The shoes I am wearing are my number one favorites but you might have seen that already in all of the other outfit posts I shared wearing the exact same pair. Hopefully this day is going by quick cause I am soooo tired and I also am looking forward to my nail salon appointment tomorrow. Just don´t know yet what color to choose but I think I might go with red. Haven´t gotten a bright red on my nails in a while so that would be nice again. But who knows. I always get so distracted by all the different colors and choose a total different one in the end. As always thanks for stopping by. Take care. See you.